Angel Dogs with a Mission: Divine Messengers in Service to All Life by Minnesota authors, Allen and Linda Anderson (New World Library, October 2008), is a collection of twenty true stories about dogs who found their purpose in life and gave bucket-loads without expecting a return. The foreword is written by Marc Bekoff, PhD, professor emeritus of ecology and evolutionary biology at the University of Colorado, Boulder. As with the hugely popular Marley & Me, millions of dog lovers will want to be inspired and entertained by the dramatic human-and-dog journeys in this new book. The amazing stories provide laughter, proof that miracles are possible, and tears - the good kind. "As teachers, friends, therapists, healers, and rescuers, dogs enrich our lives immensely. They don't ask much in return -- a tummy rub, a smile, a game of fetch. Our world would be much poorer without dogs like those in this book and our homes." "Read this book and share it widely. Read these stories to kids. Angel Dogs with a Mission will change your life and the lives of those with whom you share it." "This book is a tribute to the fact that many of our most effective doctors, nurses, therapists, police officers, emotional counselors, rescue workers, and spiritual teachers have four legs instead of two." 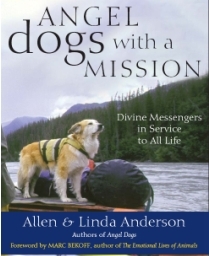 "The 10th book by Linda and Allen Anderson, founders of the Angel Animals Network (www.angelanimals.net), Angel Dogs with a Mission: Divine Messengers in Service to All Life, collects true stories of the achievements of working dogs." Angel Animals® Network Copyright © 2008-2010. All rights reserved.